This image was created from the first combined image and motion measurements from the AMBER instrument on the Very Large Telescope Interferometer (VLTI) at ESO’s Paranal Observatory in Chile. 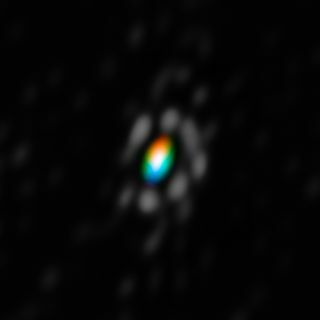 It shows the mysterious disc of material around the brilliant supergiant star HD 62623. The picture has been colour coded to show the velocities of the material in the disc: blue indicates that the material is coming towards us, and red that it is receding. A giant star nearing its death is surrounded by an unusual cloud of gas and dust that is generally only found around baby stars, as revealed by a new 3-D imaging technique. The chubby star, called HD 62623, is an exotic stellar supergiant. Unlike almost all stars of that spectral class — including its well-known twin, the bright star Deneb located in the summer triangle — HD 62623 is surrounded by a dense shroud of plasma and dust. Hot supergiant stars are extremely bright and radiate so strongly that their stellar wind would normally prevent matter from condensing as dust around the star. Using an interferometer, which combines information from multiple spaced-out telescopes, researchers from the Max Planck Institute for Radio Astronomy in Germany adapted a new imaging technique to probe the strange star. The team generated the first three-dimensional, high angular and high spectral resolution image of HD 62623 and its environment. The data were collected from the Amber instrument at the Very Large Telescope Interferometer (VLTI), which combines measurements from telescopes at the European Southern Observatory's Paranal Observatory in Chile. From their analysis, the astronomers conclude that a companion star, with a mass roughly equivalent to the sun, is likely the key to HD 62623's strange baby-like features. The results of their study were published on Jan. 7 in the online edition of the journal Astronomy & Astrophysics. "Thanks to our interferometric observations, we could synthesize a 3-D image of HD 62623 as seen through a virtual 130 m-diameter telescope," said Florentin Millour, lead author of the study, in a statement. "The resolution is an order of magnitude higher compared with the world's largest optical telescope of 8 to 10 m-diameter." 3D images of the supergiant star HD 62623, obtained with the VLTI (left), compared to the model of a rotating disk (right). In the boxes, the gas kinematics is shown: blue-colored gas approaches the observer, while red-colored gas recedes from the observer. The images obtained using this technique combine spatial and velocity information, showing not only the shape of HD 62623's surroundings, but also the motion of the environment. "Our new 3-D image locates the dust-forming region around HD 62623 very precisely, and it provides evidence for the rotation of the gas around the central star," said researcher Anthony Meilland, who was also involved in the study. "This rotation is found to be Keplerian, the same way the solar system planets rotate around the sun." A nearby companion star, with about the same mass as the sun, could be the reason for the uncharacteristic disk around HD 62623, the researchers said. This companion was not directly detected because its brightness is thousands of times lower than the primary star, but its presence is betrayed by a central cavity between the gas disk and the central star. The new 3-D imaging technique greatly improves astronomers' capacity to detect fine details in the resulting images, and could have broad applications, the researchers said. "With these new capacities, the VLTI will be able to provide a better comprehension of many sky targets, too small to be resolved by the largest telescopes," Millour said. "We could aim at young stellar disks or jets, or even the central regions of active galaxies."